Arbour Lake residents are actively engaged in their community and keeping them informed is our top-priority. 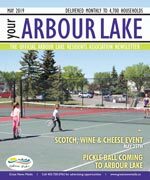 Your Arbour Lake is the official community newsletter, and covers community news and is published monthly to keep content current and relevant. Delivered to every household, apartment, and business, every resident is acquainted with the community’s most important information. The community that has is it all! A pristine lake brimming with rainbow trout, neighbourhood parks, spectacular mountain views, a regional bike and walkway path carved through rolling hills. Swimming, boating, fishing, ice skating, concession, community events and much more. Your activities are only limited by your imagination. As Northwest Calgary’s only lake community, Arbour Lake offers a quality of living unmatched. The Arbour Lake Residents Association is a limited company that was registered under the laws of Alberta on July 19, 1991. The purpose of this company is to care for, and improve upon, the Arbour Lake amenities, with the main focus being a pristine ten-acre lake in the heart of the community. In the City of Calgary’s 2012 municipal census, Arbour Lake had a population of 10,836 living in 3,918 dwellings, a 0.7% increase from its 2011 population of 10,762. With a land area of 4.4 km2 (1.7 sq mi), it had a population density of 2,463/km2 (6,380/sq mi) in 2012. Residents in this community had a median household income of $70,590 in 2000, and there were 7.4% low income residents living in the neighborhood. As of 2000, 25.1% of the residents were immigrants. A proportion of 8.7% of the buildings were condominiums or apartments, and 4.1% of the housing was used for renting. For more detailed info visit the City of Calgary community profiles site.